Alekos Demetriou gave Iolanthe Petrakis one sinfully seductive night, never knowing that his enemy's daughter left carrying his child. Ten years later, after discovering Iolanthe's secret, Alekos declares he will legitimize his son—and that they will marry! Impoverished Scarlett Ravenwood has no choice but to interrupt wealthy Vincenzo Borgia's wedding—she needs his help protecting their unborn child! To claim his heir, Vincenzo has no choice but to marry Scarlett. She suddenly has everything—except his heart! Mikolas Petrides will secure a business deal in marriage. But when he lifts the veil, he finds his intended's protective sister—Viveka Brice! With the marriage canceled, Viveka must compensate Mikolos somehow—and he's determined to make her his mistress. An unexpected encounter with notorious temptress Bella Sanchez has Prince Antonio De Santis breaking his rules about women. Antonio's entrance shakes up Bella's empty life, and she can't resist a forbidden affair. But can she tame the De Santis prince? 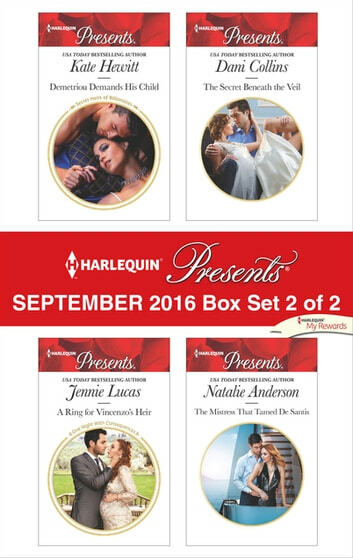 Be sure to collect Harlequin® Presents' September 2016 Box set 1 of 2!